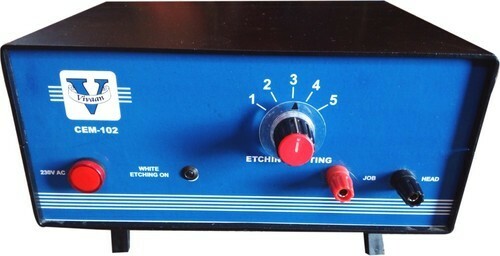 Being a noteworthy enterprise of this industry, we are offering a wide spectrum of CEM102 Chemical Etching Machine. Incorporated in the year 2016, at Aurangabad, (Maharashtra, India), we “Vivaan Marking Solution” are a Sole Proprietorship firm and a leading manufacturer and supplier of top quality range of Pneumatics Pin Marking Machine,Chemical Etching Machine, CO2 Laser engraving & cutting machine & Fiber Laser Machine . Under the visionary direction of our mentor “Mr. Dushant G. (Proprietor)”, we have attained a dynamic and remarkable position among our competitors. We are offering our products under the brand names Vivaan.